If you have an iPhone 3G, you can use the built-in GPS feature to find your current location. Simply tap the Maps icon in the Applications screen, and then tap the little compass in the lower-left corner. With an iPhone 3G, a blue marker shows your GPS location. 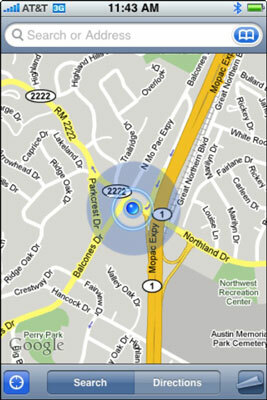 A pulsating blue marker indicates your location on the map when its GPS is used to find your location. Otherwise, a somewhat larger circle is used to show your approximate location. Either way, when you move around, iPhone can update your location and adjust the map so the location indicator stays in the middle of the screen. Keep in mind that if you tap or drag the map, your iPhone continues to update your location; but it won’t re-center the marker, which means that the location indicator can move off the screen.